One more horrific prediction has come to pass for California’s drought-ravaged forests. According to the US Forest Service, trees are dying at an even more astonishing rate than they were last summer, creating fuel for what will almost certainly be the worst wildfire season in memory. It’s not just a lack of water that’s killing California’s trees. When trees become stressed they’re not able to produce the thick resin that keeps out bark beetles, which can consume the tree from the inside out. Even in places with low fire risk, beetle-killed trees can easily topple, poising danger to hikers and campers. Fire suppression, also called “fuel reduction,” is itself a controversial and expensive endeavor. 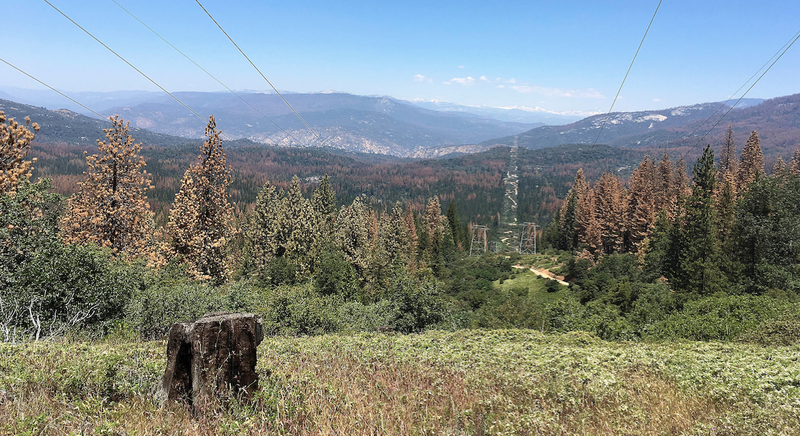 Some California forests plan to use incinerators that will turn the trees into biomass before they become tinder. Beetle-killed pine is also popular for furniture makers. Fire’s a natural part of forest regeneration, of course, but with a fire season that’s about 20 percent longer than it was just 30 years ago, that makes forests much more vulnerable to human-set fires. Case in point, a car crash high in the mountains northeast of LA which is now responsible for burning over 4,500 acres. It’s gonna be a long summer.